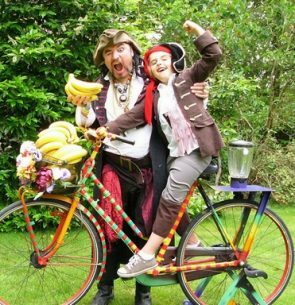 Kids entertainer Captain James Tea Cook - Pirate of the Carob Bean will be hosting a series of dynamic and fun cookery classes for the little ones. Legendary Captain James Tea Cook, Pirate of the Carob Bean's mission is to educate primary school aged kids, their parents and siblings about optimal health through free cookery workshops, fun, magic, dancing and lots of shouting. ASD friendly and allergen aware. Children should arrive with washed hands and long hair tied back. Eating the food they create is enthusiastically encouraged. "The theme be getting yer kiddywinks to be eating more vegetables, at least 5 portions of veg a day choosing one from each colour of the rainbow. So apart from the smoothie bike, the cookery workshops where we makes Rainbow sushi, pancakes, kebabs, snack balls, wraps and stacks and the kitchen science where we finds electricity in bananas, learns about emulsification and alkalinity we also has a few rainbow games. The games include Rainbow Ring Toss, 5 Veg in Bucket, Rainbow VeggieTin Can Alley and a bit of Vegetable themed pirate dancing. There also be some crafts such as High 5 Rainbow Hands, Potato friends, and Pirate Hat making - if you be lucky, some magic too"
Please note: Children must be supervised by a parent/guardian at all times.